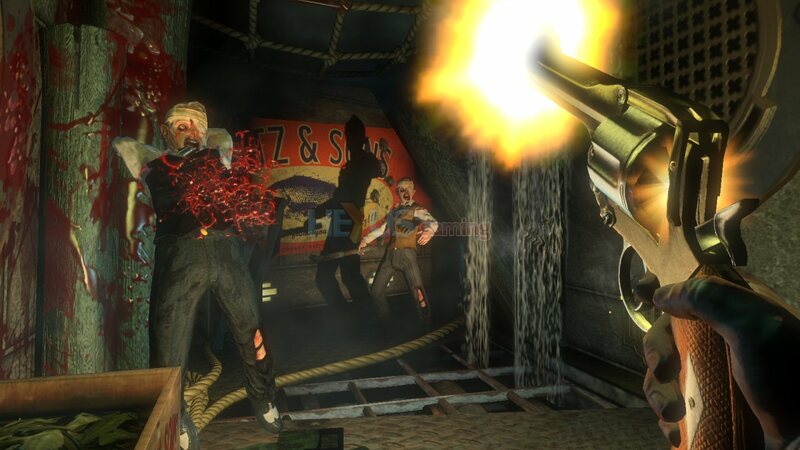 Bioshock: An FPS with a plot? WTF! Some games have badass fighting systems, like Borderlands. Some are fun for questing and grinding, like World of Warcraft. I was surprised to find an FPS with a story that shocked me and made me laugh AND had cool combat. 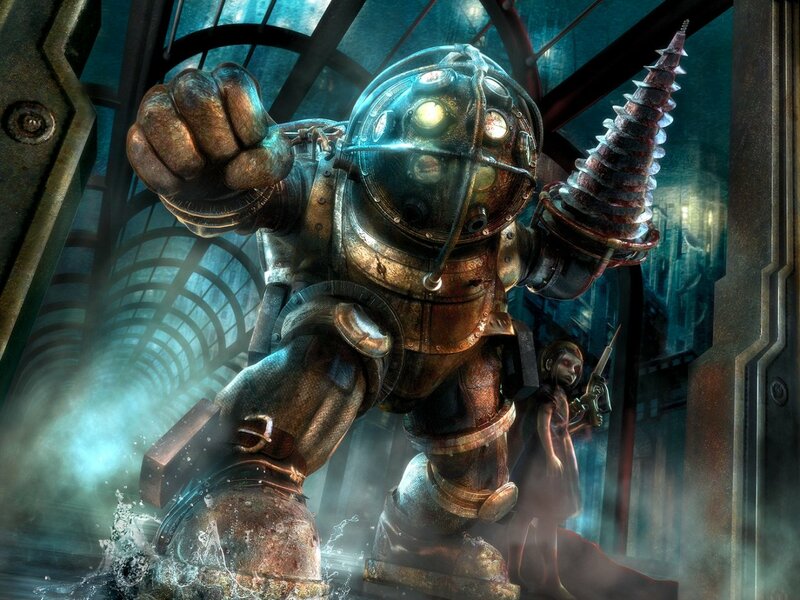 Bioshock is an FPS released in 2007 for PC/360/PS3 by Irrational Games and 2K Games. It has been lauded as a great game, for its “morality-based” storyline, immersive environment and Ayn Rand-inspired dystopian back-story” (wiki). The narrative is impressive for an FPS. With FPS games, you generally think fighting is going to be the primary element, and the plot is going to be completely secondary. However, Bioshock is the opposite, and in fact the style of combat actually works with the story. It’s 1960, and your character (Jack) is trapped in Rapture, an underwater utopian city turned dystopian, broken science experiment, and you must find your way through the broken passages to escape and, ultimately, go up against the forces behind Rapture and its downfall. The obstacles? Plasmid-junkies, called splicers, have taken over the city, and these genetic nightmares have become addicted to the gene-altering substance called Adam that gives you superhuman powers and, long term, turns you into a murderous monster. Along with these freaks are the roaming Big Daddies and the Little Sisters they protect. And of course to defeat these enemies, you get to use the same plasmids. Send bees to attack your enemies, freeze and shatter them, or set them on fire. Or, use the many fun weapons and changeable ammo, from a simple wrench or revolver to the chemical thrower or crossbow. It was like watching an interactive movie for me. The narrative has nice variety in storytelling methods, especially in the nonlinear way you piece together the whole story. Because you’ve come after Rapture has basically imploded, you have the visuals of the derelict areas and all the lovely mutated residents to infer what happened. There’s a lot of good dialogue, even though the characters don’t interact; it’s mostly monologues, instructions, and recorded journals. Thematically, this game has everything from the downfalls of addiction (ala Repo: The Genetic Opera), the politics of power, and human folly and hubris. The characters are well-developed, especially towards the end when the plot really gets going. It’s a unique, engaging story, with lots of little details that make you want to puzzle it all out. The role of the Little Sisters is especially intriguing, as they are both enemy and benefactor. I only have one complaint; while the end changes based on your ethical decision, it was unsatisfying in relation to the rest of the plot (a common problem in game plots). While I was not the one on controls, I will say that playing an FPS on the 360 is not ideal. Aiming is better on the PC, so it’s tougher to use the Plasmids. However, there are many opportunities to use whatever weapon or Plasmid you want. Also, the environment is seriously creepy yet gorgeous, like ancient ruins that aren’t quite abandoned.The first person perspective, emphasis on exploration, and player projection into the first person perspective adds to the reality effect and more fully involves you in the game. You are encouraged to pay attention to the environment, with the quests, backtracking, searching for items, and having to interact or push buttons or things like that. Overall I would rate this game an 8/10, definitely a game to pick up. Strong story, characters with depth, varied combat options, high level of engagement—this game has it all. Go get lost in Rapture, if you haven’t already, before you’re left behind with the release of the sequel. I return to one of my favorite topics always on my brain: how is life like a video game? Today my topic shall be leveling up. It’s an RPG concept that is easily applied to real life experiences and events. I think of age as like your level. At level 1, you don’t have much. You’ve got crappy starting equipment, no money, no concept of money yet. You’re still figuring out the system, how everything works. By level 5, stuff is either really easy or really hard. You’ve gotten an idea of how to do what you want. You may struggle with not having much in the way of equipment or money, which makes the little things matter that much more. There are probably more un-interactive or static cutscenes than you’d like and than you’ll probably remember later. In your 20’s, you look back at where you’ve come from and realize how little you’ve really accomplished in the grand scheme. You gain experience in lots of little ways, and sometimes in leaps and bounds. Nothing is quite as hard as it seems, but you don’t really realize that until something harder comes at you. At 25, you may not be sure yet who will be permanent party members or who will just be cameo characters. The plot is still kind of a mystery. I’ll have to reserve my judgment on the next levels until I reach them myself, but based on this game logic your middle age levels have some pros and cons. You’ve finally made some money and traveled a bit. You may have some nice transportation (like a 1972 Mercedes Airship in metallic mint green) and a fully furnished house (somewhere to keep all that loot with easy access to merchants). But whether you’re living in Tenpenny Towers or the shack in the Imperial City, it doesn’t change the fact that you’ll be facing tougher challenges than when you were lower level. More boss fights (that may, for example, kill you and cause you to restart) and more minions to deal with (middle management-types have a 50% weakness to fire), but more experience with your chosen profession/class and more . The plot may be thickening, with family or work, or it may be dragging on as the game gives you a chance to catch up on some exploration and leveling. You may have invested energy in leveling characters who leave halfway through the game for some ill-defined reason. You’ll probably never reach level 100 unless you power level, which isn’t really much fun all the time. Some people obsess over it (see healthy foods, exercise, or good genes/character class). And no one really knows when they’ll finish the game. It may be after power training all your Pokemon to level 75 to beat the Elite Four. You may have an idea based on the plot and other cues that the final boss fight is coming, and the game will end soon. Or the game may never really end; like so many plotlines in life, you may keep going back to them even after you think they’re done. I realize there are a few problems with this extended metaphor. There are many guides to life, but no one’s quite gotten them right yet, no matter what they claim. The Konami Code will not help you; you can’t really cheat to get ahead, beyond a basic gold glitch or item dupe. Spoilers are actually a good thing; if you have an idea of what’s coming based on others’ experiences, you have a better chance at surviving. You don’t really have as much control over party members’ actions as you might like. And, finally, sometimes level doesn’t really matter. Sometimes you get pwned by a boss half your level, or get lucky and beat one twice yours. Sometimes you need to rely on your Luck, or Personality, or Defense, to get you through. And at the end of the day, you never really know which level up will be your last, so you should try to enjoy every single level. Ding!